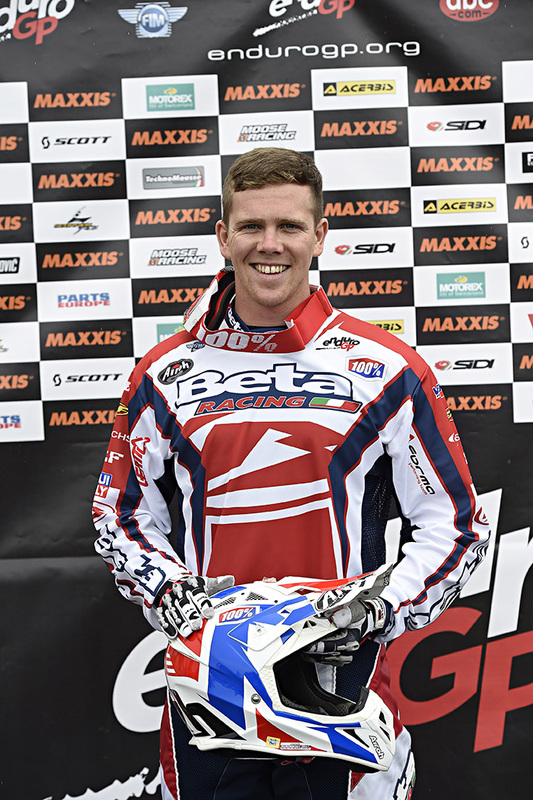 Steve Holcombe (Beta) successfully defended the FIM EnduroGP World Championship in 2018, with a dominant finish to a rollercoaster campaign that started with defeat at the opening round. Picking up only a handful points as home stars Aleksi Jukola (KTM) and Eero Remes (TM) took the wins in Finland, Holcombe then broke two ribs on the second lap of round two in Spain but after a day one triumph for the experienced Alex Salvini (Husqvarna), Holcombe proved his championship credentials as he fought through the pain to win on day two. After a Salvini double in Portugal, last year’s FIM Junior Enduro World Champion Brad Freeman (Beta Boano) then scored a breakthrough debut win on just his fourth outing in the Senior ranks in Estonia, which was followed by back-to-back wins for Salvini that opened up an eight-point advantage for the Italian in the standings following his single-day triumph in Trentino. As Holcombe slowly battled back to full fitness, the Brit produced arguably his best performance of the season over the small stones and roots of Edolo and, as Salvini struggled in his home round, he took over at the top of the championship for the first time, establishing a 35-point lead with two rounds remaining. After sharing the wins with his Italian rival in France, Holcome went into the final event in Rüdersdorf needing to secure just a handful of points in order to lift the overall EnduroGP crown but he did it in style, signing off on top of the podium to confirm his status as the leading Enduro rider in the world. Meanwhile, a disastrous final day for Salvini saw him slip from the championship podium by just three points, as Freeman completed an impressive rookie season in the runner-up position with the consistent Remes moving up to third. Steve Holcombe (Beta) reclaimed the FIM E3 Enduro World Championship he last won in 2016 with a dominant campaign in the class, despite sustaining a nasty injury early in the season. After missing the podium at the opening round in Finland, won on both days by local expert Aleksi Jukola (KTM), the Tallin event proved to be the only two days he would finish outside the top two in the E3 class for the remainder of the season - despite picking up two broken ribs at the second round! After conceding an opening day win to Danny McCanney (Gas Gas) in Spain and Christophe Nambotin (Gas Gas) in Portugal, bouncing back to win the second day in both, Holcombe then strung together doubles in Estonia, Italy and France, as well as a single-day win in Trentino, to leave himself with a 36-point advantage going into the final round. If there were any lingering questions about Holcombe’s fitness or finesse, he answered them in style at Rüdersdorf, smashing out another double on the weekend that also saw him crowned 2018 FIM EnduroGP World Champion. Three-time FIM World Champion Nambotin and McCanney put up a brave resistance, sharing the podium together with Holcombe on six occasions, with the Frenchman picking up six second places – one more than the Brit - to add to his win at Castelo Branco, and shade the runner-up position in the championship by just two points. However, neither of them had an answer for Holcombe, who at the age of 24 is already a four-time FIM World Champion. Steve Holcombe (Beta) claimed his second Enduro title in as many years when he clinched the coveted FIM EnduroGP World Championship at the final round in Germany in October. In just his second season as a full-time rider, Holcombe backed up his surprise 2016 E3 title with another sensational campaign, clinching Enduro's premier-class crown in style with his fifth victory of the year at Zschopau. With EnduroGP established as a standalone category in 2017, as opposed to the title going to the cumulative best of E1, E2 and E3 like last year, Holcombe established his intentions with second place at an opening round won by home wildcard Antti Hellsten (Husqvarna) in Finland, after a close battle with defending champion Matt Phillips (Sherco), who took third. Holcombe and Phillips again went head-to-head at the next round in Spain, joined by three-time former World Champion Christophe Nambotin (KTM) in a thrilling three-way battle that eventually went the way of the Australian. Frenchman Loic Larrieu (Yamaha) then took a special first EnduroGP win for him and Yamaha at the GP of Italy as Holcombe extended his championship lead in second place. The Brit was again second to Nathan Watson (KTM) in Greece and when he took a third day win of the season in Portugal he had one hand on the trophy. A sensational performance in his home round, a unique Enduro Sprint at Hawkstone Park, when he dominated each of the six runs, gave Holcombe a forty-point advantage going into the final round. Far from riding within himself to secure a safe title, the 27-year-old headed off the challenge of Nambotin and Larrieu to finish with a flourish. Steve Holcombe (Beta) announced his arrival as Enduro's newest star, clinching the FIM E3 Enduro World Championship and even challenging for the EnduroGP title in his debut season. The 22-year-old Brit stepped up from the FIM Junior Enduro World Championship after finishing third in 2015, convincing Beta to team him up with former FIM E2 Enduro World Champions Johnny Aubert and Alex Salvini for 2016. The pair's experience rubbed off on the newcomer, who took three day wins from the opening two rounds to claim a surprise lead in the championship. Holcombe proved his early form was no fluke over the remainder of the season, taking a further nine wins including three doubles in Sweden, Italy and France. The first day of that final round at Cahors proved to be his title-clinching ride, taking the lead on the opening lap and leaving title rivals Manuel Monni (TM) and team-mate Aubert in his wake. Third place for Aubert meant that the 36-year-old had completed a famous championship one-two for Beta, with Monni following up his second place with fourth on day two to seal his career-best championship finish in third. Holcombe's day two victories in Portugal and Italy, as well as his double in Sweden, were all good enough for maximum EnduroGP points, propelling him onto the championship podium in the historic first season for the new series.